You are here: VERDEVER > Sin categoría > FLOTANTE press review. A thin row of lights on the stage at ground level delimits the territory. Inside balloons float at different heights, anchored to a light weight. The character tries to lift them, let them fall in another side, unite them, separate them. The balloons move through space like rising bubbles, we are in deep water. Opposite, the small spectators follow every detail smiling. At some point they will cross the shore to immerse themselves in the action and turn into actors of a collective performance. A large fish will enter the scene in successive moments, sustained in its navigation by three balloons; followed by a series of jellyfish and a large jellyfish-mother. They generate new scenes starring the actress and her small partners. As they are carried by the waves, they meet in brief collective actions and disperse in sequels of individual play. And again. The whole looks a captivating beauty. 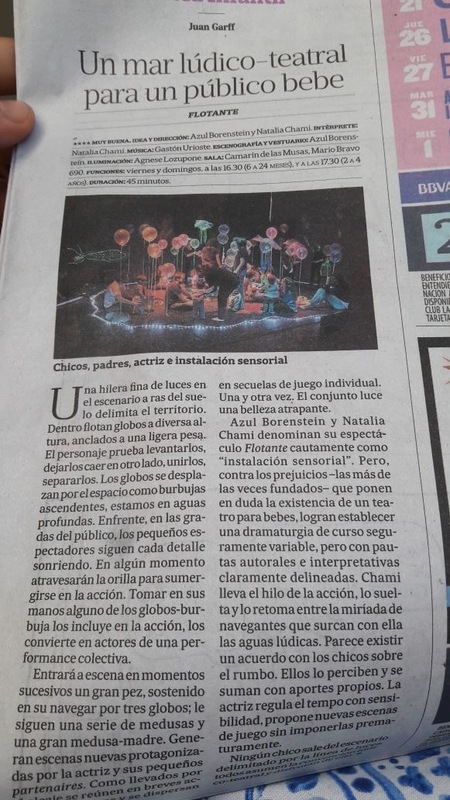 Visit La Nación newspaper website and check the press review in Spanish >here<.